hi- just wanting to confirm age/era of this cool little trike. I think it is 50's or 60's, but wondering which. The pedals and grips aren't original. Solid rubber tires. Very heavy solid steel with that huge front fender/wing. Made in Canada for CanadianTire Corp, Supercycle brand. (I think the tag actually says MasterCycle, but it is CanadianTireCorp) Wondering if I should let my neighbour's kid ride it all summer, or whether it's worth keeping as a collectors piece. I think it deserves preservation.It may not be worth alot but it is interesting.It looks like a Thistle. (Hard to say because for some reason I could only see the top part of your pic. )I recently found this little trike at a garage sale and couldn't pass it up. 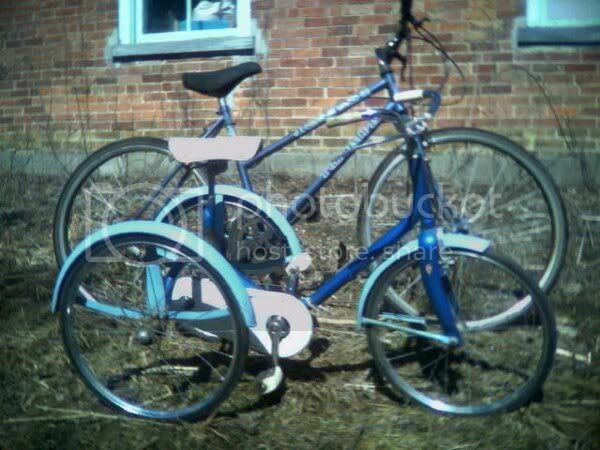 I'm not sure of the year, but it's a Raleigh Lion trike with chain drive to back wheels. It's got 16" solid rubber tires and a rod-brake on the front wheel.I'm going to hang it from the ceiling in my workshop.I don't want it being used.It's survived this far and is still pretty mint original.I would gladly add yours to my collection. sorry about the pic, it should be working, when I go to the site it loads fine. At any rate, it's not a Thistle, it is a Canadian Tire bike, as the crest says. I have a Thistle, big men's bike, too. Anyway, I'm pretty sure it's 50's. It's a little bike, not like your trike. It's for a little kid, maybe 4-6 yrs. Would be very cool to hang, but the neighbour thinks it's the best thing ever, and I'd like to see it get some use, looks like it's barely been used. And the kid really wants it. You know how that is.... we all wanted cool bikes! I here you there. And besides, the child will grow out of it soon enough.As long as they take care of it, you can get it back in roughly the same condition.The one I have is a little bit larger but the seat only comes up to my knee.And that's with the seat post fully extended.The only reason I don't want this one ridden is because it is a flimsy design. It has already been repaired(welded) once. I do agree that bikes are made for riding.Not just wall art.I have 35 vintage bikes and ride them all(at some point).But I'll never be able to ride this one. I have an original Schwinn World Traveler bicycle purchased in 1953. First one with 3 speed shifter, chrome fenders and generator on rear tire. All original. My father bought it for me in 1953. Still can be riden. Anybody have an idea what the value is??? It's probabely worth alot. Do you have any pics? Check out bicyclechronicles.com. Totally Schwinn site! I'm trying to determine the age and value of an "America" bicycle manufactured by Excelsior, Michigan City, Ind. My bike is green with a tank, fenders, rack, large coil suspension on front fork, red rubber tires and very wide handlebars. All parts/paint appear original. The number stamped on the down tube is: J289518. Any info. would be appreciated. I posted this in the tandem section responses there appear slow to non excistantthere so trying here.I refurbed an Atom drum brake on a 70s Schwinn tandem.It seems to stop better but not as I expected.Even though adjusted so it is lightly rubbing and tight cable I can still bottom the hand lever against the grip.It stops pretty good but I expected more. Front caliper is signifigantly better.Is the drum intended more for extended heavy braking with a load and not expected to lock up a wheel?How thick are the brake linings? The problem might be cable stretch.Because the cable is so long it's stretching inside the sheathing.The drum brake should be able to skid the back tire no problem.I would suggest changing the cable for one for a motorcycle or a bmx.They are much ticker and wound differently.Worth looking into. i found a MINT SHAPE!!! ccm encore girls bike, two small tubes going down frome the handel bars to the pedals green in color, original ,hardly a scratch on it... what is it worth? I would say the value would be somewhere around $30-40.